Can !Draw have added the ability to set the background colour so something other than white. Also i would like to see the canvas size to be set to any size, user defined. I also think the zoom feature needs to go beyond 8x, paint does. I would like to see the ability to edit text in its frame and not in a pop up writeable icon. Its darn annoying to keep shifting my eyes up to the top left corner of the window just to edit a bit of text. Super annoying when theres a number of texts that want editing. 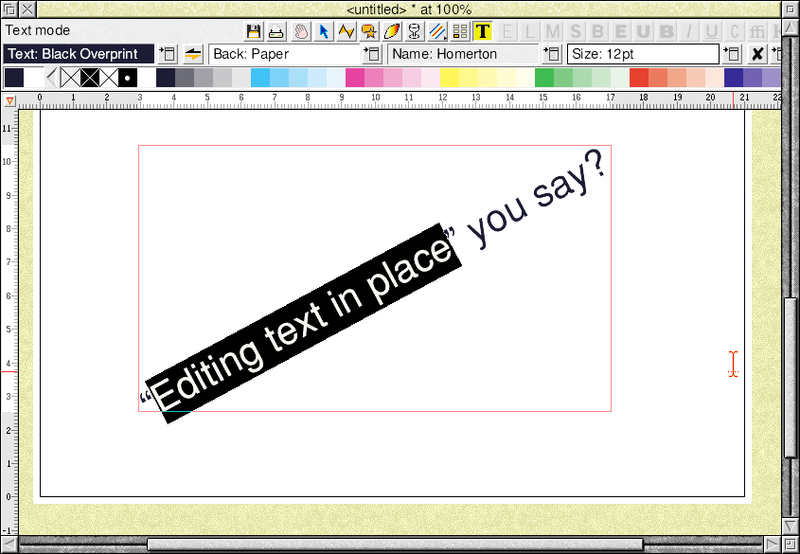 It would also be useful, I would imagine, If dragging text into a Draw window could then be editable, font selected, resized etc. 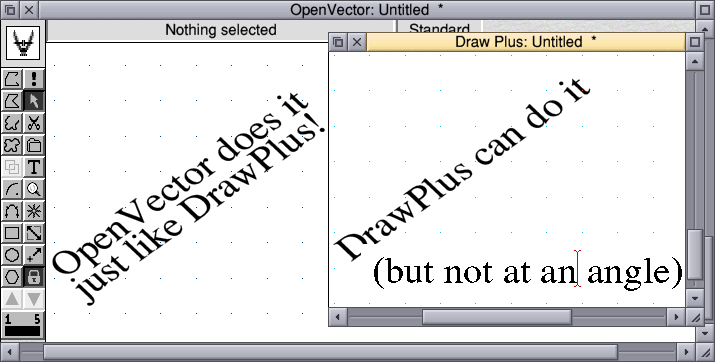 Try DrawPlus. It’s basically everything that Draw should have been. I try to avoid text areas, formatting is clumsy as hell and the specification is lacking. Maybe Draw(Plus) could benefit from an importer that creates a series of proper text objects from imported text, rather than a textarea (that honestly looks like it was bodged in as an afterthought). I’m just trolling you, Steve. 1 One would surely have to bump the revision a small2 amount for an addition like that. And you can still buy ArtWorks, and run it on modern machines too! So can Impression. Using the OLE feature you can import a file that is treated on import like a Draw graphic (it is actually a Draw file [but not typed &AFF] with a tag embedded that contains the source that created it) and CTRL-double-clicking on it will open it in the application that created it. 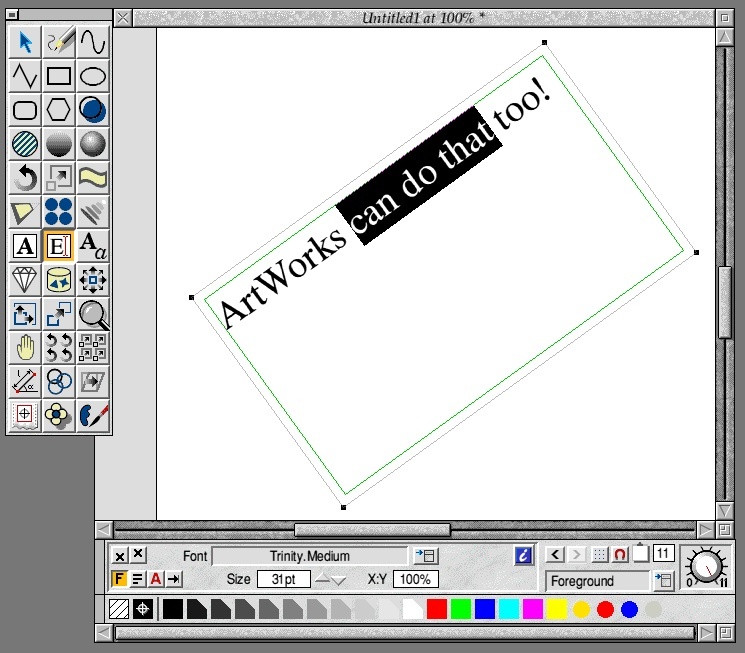 ArtWorks can do it if the particular application and file type are hard coded within it (at present I only know of TableMate files that do this). Neither do edit-in-place-with-rotated-text, but they do edit in situ which is a lot better than plain old !Draw. Thanks everyone for the pointers. Will check out DrawPlus. It seems like the more draw like.